No matter where you are in your career, you've probably dealt with some form of organizational change. Change can be a frightening prospect, and if you do not handle it correctly, it can lead to derailment. To be a successful leader, you must learn to adapt to a wide variety of situations, opportunities, and environments. This guidebook will show you how change affects you, your thoughts, and your emotions. It will give you tools and strategies that will allow you to take action not just to survive change, but to thrive in it. 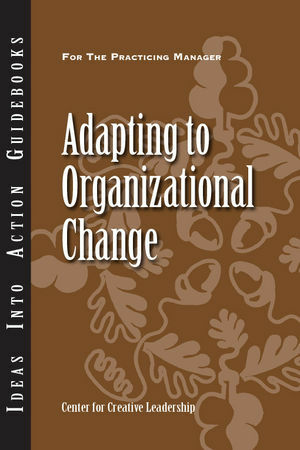 Center for Creative Leadership (CCL) is the author of Adapting to Organizational Change, published by Wiley.